Scientists have found unmistakable evidence for a stratosphere on an enormous planet outside our solar system, with an atmosphere hot enough to boil iron. An international team of researchers, led by the University of Exeter and including researchers from PlanetS*, made the new discovery by observing glowing water molecules in the atmosphere of the exoplanet WASP-121b with NASA’s Hubble Space Telescope. In order to study the gas giant’s stratosphere – a layer of atmosphere where temperature increases with higher altitudes – scientists used spectroscopy to analyse how the planet’s brightness changed at different wavelengths of light. Water vapour in the planet’s atmosphere, for example, behaves in predictable ways in response to certain wavelengths of light, depending on the temperature of the water. At cooler temperatures, water vapour blocks light from beneath it. But at higher temperatures, the water molecules glow. The phenomenon is similar to what happens with fireworks, which get their colours from chemicals emitting light. When metallic substances are heated and vaporized, their electrons move into higher energy states. Depending on the material, these electrons will emit light at specific wavelengths as they lose energy: sodium produces orange-yellow and strontium produces red in this process, for example. The research is published in leading scientific journal Nature. Artist view of Wasp 121b and its star. Credit NASA, ESA and G Bacon STSci. 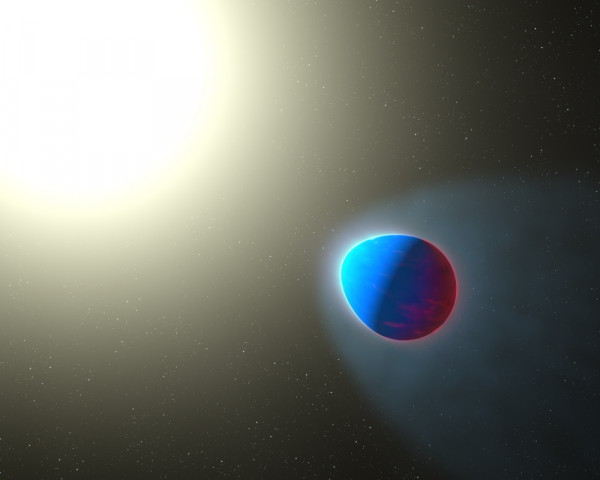 “Detecting the light emitted by hot steam in this exoplanet is a decisive step towards understanding how the atmospheres of such extreme planets work,” said David Ehrenreich, co-author of the study, associate professor at the University of Geneva and principal investigator of the European Research Council project FOUR ACES*. “Now the next step is to track down and identify the molecules responsible for the temperature rise”. WASP-121b, located approximately 900 light years from Earth, is a gas giant exoplanet commonly referred to as a ‘hot Jupiter’, although with a greater mass and radius than Jupiter, making it much puffier. The exoplanet orbits its host star every 1.3 days, and is around the closest distance it could be before the star’s gravity would start ripping it apart. This close proximity also means that the top of the atmosphere is heated to a blazing hot 2,500°C – the temperature at which iron exists in gas rather than solid form. In Earth’s stratosphere, ozone traps ultraviolet radiation from the sun, which raises the temperature of this layer of atmosphere. Other solar system bodies have stratospheres, too – methane is responsible for heating in the stratospheres of Jupiter and Saturn’s moon Titan, for example. In solar system planets, the change in temperature within a stratosphere is typically less than 100°C. 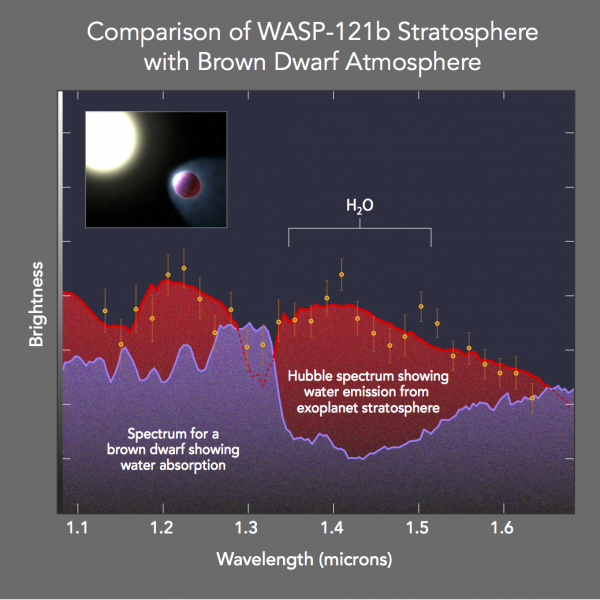 However, on WASP-121b, the temperature in the stratosphere rises by 1,000°C. Vanadium oxide and titanium oxide gases are candidate heat sources, as they strongly absorb starlight at visible wavelengths, similar to ozone absorbing UV radiation. These compounds are expected to be present in only the hottest of hot Jupiters, such as WASP-121b, as high temperatures are required to keep them in the gaseous state. Indeed, vanadium oxide and titanium oxide are commonly seen in brown dwarfs, ‘failed stars’ that have some commonalities with exoplanets. Spectrum of Wasp121 system. Credit NASA, ESA and A. Feild STSci. Previous research spanning the past decade has indicated possible evidence for stratospheres on other exoplanets, but this is the first time that glowing water molecules have been detected, the clearest signal yet for an exoplanet stratosphere. It is one of the first results to come out of a new observing program being led by David Sing, associate professor at the University of Exeter, and an international team of scientists from seven countries. The program has been awarded 800 hours to study and compare 20 different exoplanets, representing one of the largest time allocations for a single program in the entire 27 year history of Hubble. NASA and ESA’s forthcoming James Webb Space Telescope will be able to follow up on the atmospheres of planets like WASP-121b with higher sensitivity than any telescope currently in space. “A stratosphere in an ultra-hot gas giant exoplanet” is published in Nature on Thursday, August 3 2017. *PlanetS is a National Center of Competence in Research, which is an instrument of the Swiss National Science Foundation. **FOUR ACES, which stands for Future of Upper Atmospheric Characterisation of Exoplanets with Spectroscopy, is a Consolidator project of the European Research Council (ERC), supported by the ERC Horizon 2020 research and innovation programme (grant agreement no. 724427).